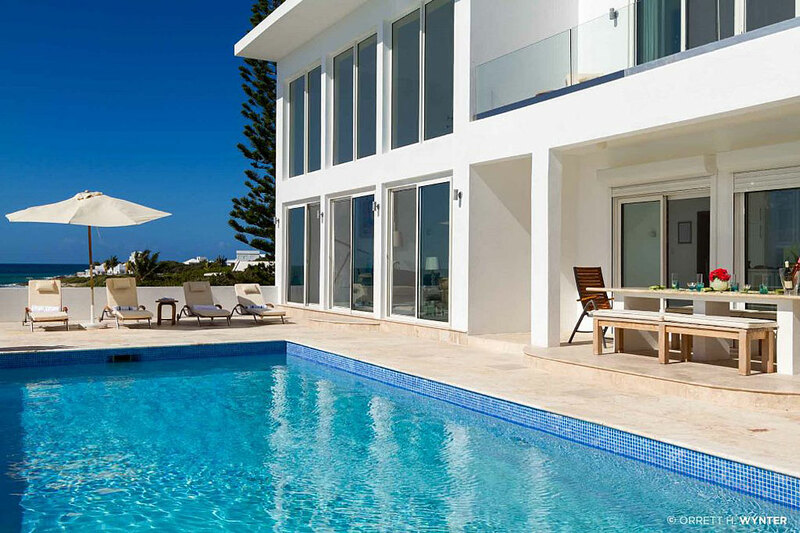 The villa, newly refurbished and extended in 2013 with further renovation in 2017 boasts among other upgraded features, an infinity pool with a spacious deck featuring comfortable sun loungers and a hammock. 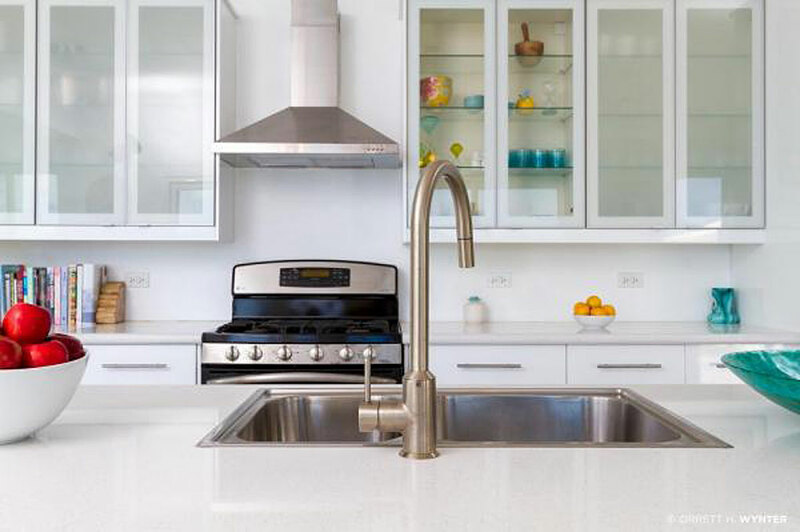 Vista has been designed to allow adequate social space with the main section of the house featuring the concept of a semi-open floor plan allowing a natural flow between the living, dining and kitchen areas. 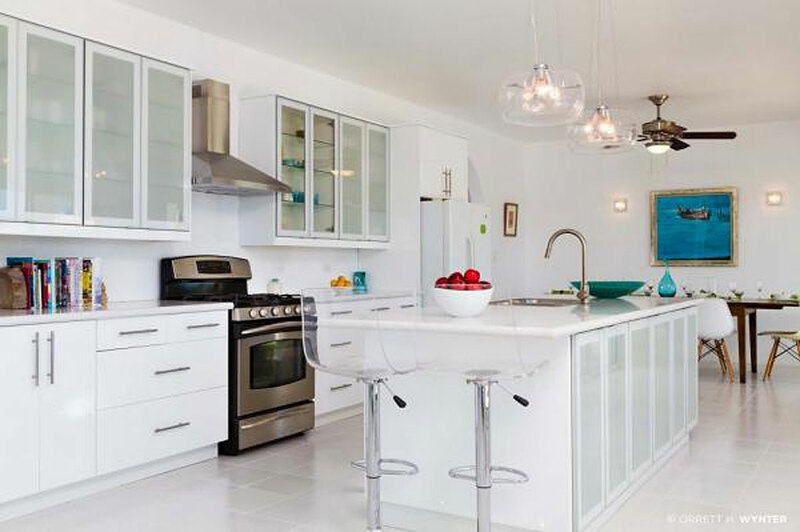 The space is enhanced meticulously with European furniture with a mixture of designer contemporary items and antiques. 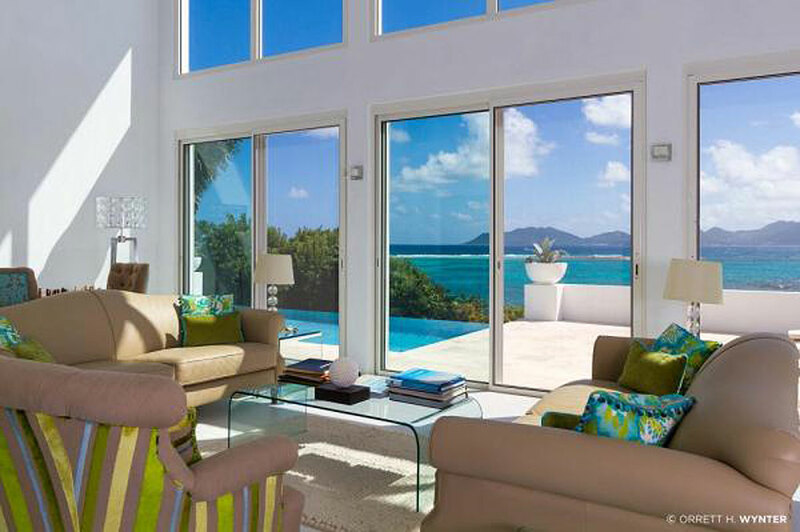 The sitting room area boasts a 20 foot ceiling with double height windows and features a chandelier by Jonathan Adler which gives way to the warm tropical breezes and a breathtaking scenery. The walls are adorned with original artwork including a piece from the acclaimed artist John Bellany. 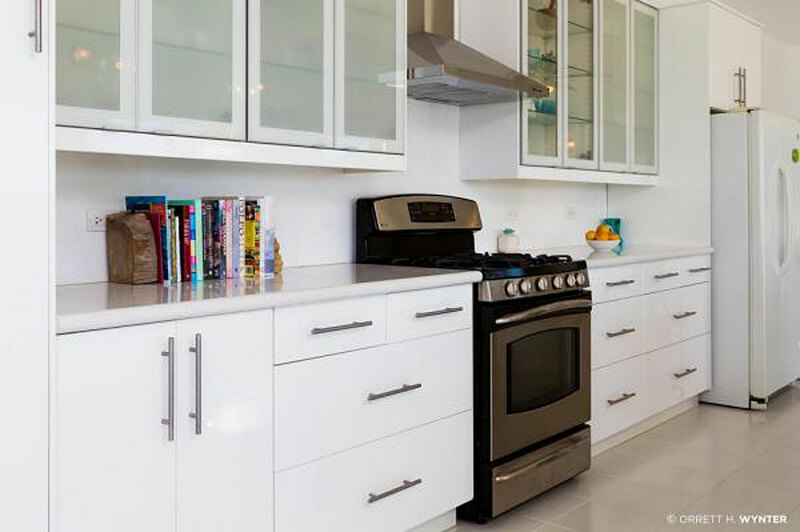 The newly renovated kitchen is fully stocked with all the required cooking utensils to facilitate the simplest of meals to a formal dinner which can be prepared by your Personal Chef as an option. 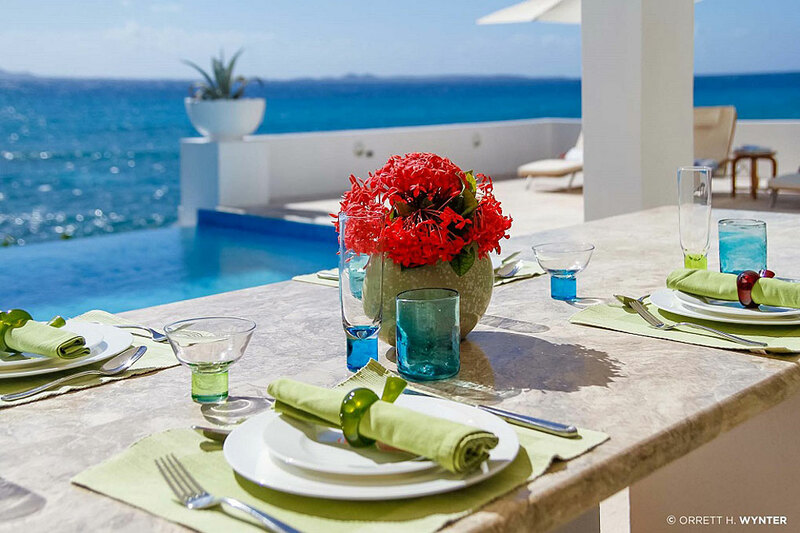 A central island offers access to a breakfast bar giving way to the most spectacular dining view. There is also an optional covered outdoor dining area in addition to the formal indoor area. Nespresso machine has recently been added fpr those guests who wish to bring their favorite coffee. 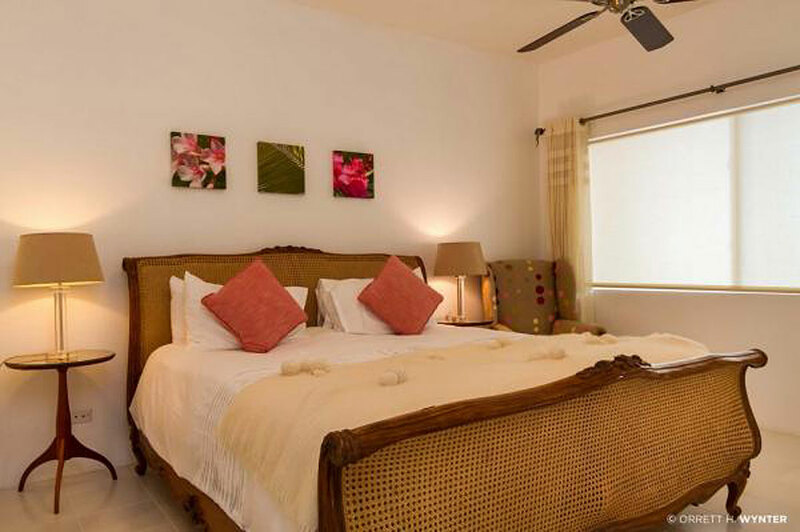 All 4 bedrooms in this villa are air-conditioned, with three located ensuite and the fourth bedroom is a twin room with a shower room immediately adjacent. 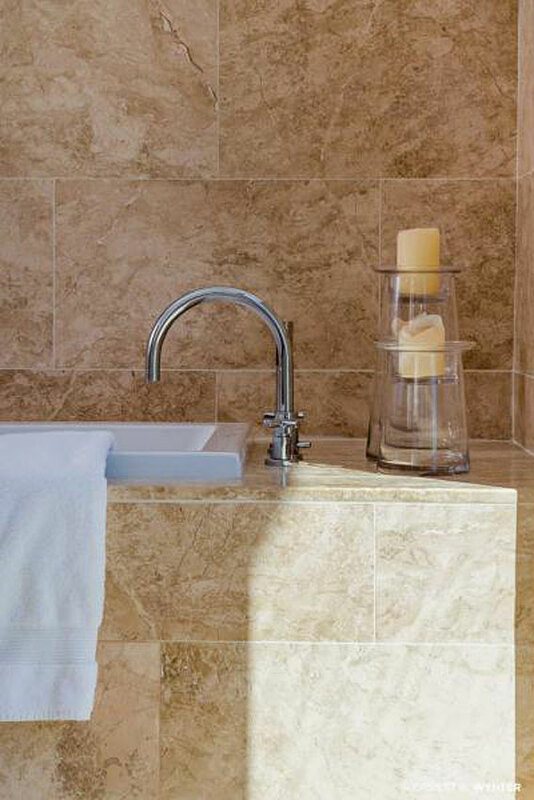 All bath and shower rooms have Anguillan stone, designer fittings and rainwater showers. 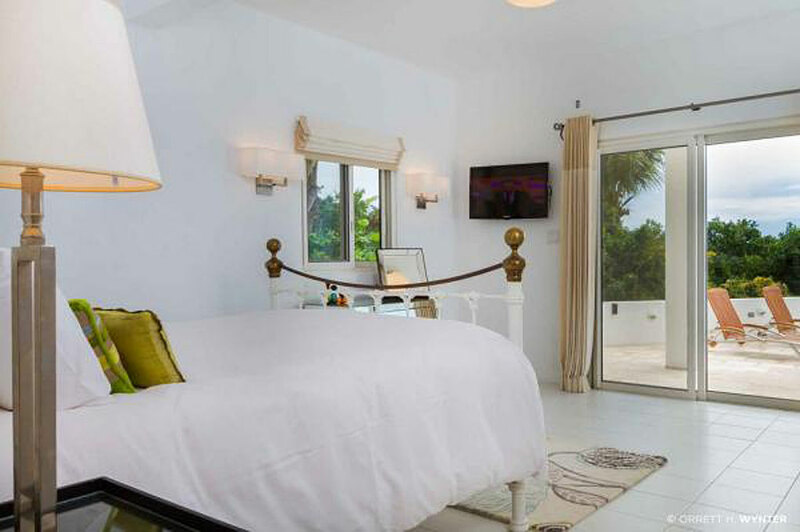 The upstairs master suite has arguably the best view on the island with a private sun deck running the length of the upper level. A beautiful antique French armoire, chaise lounge and matching master bed provides a serene sanctuary. 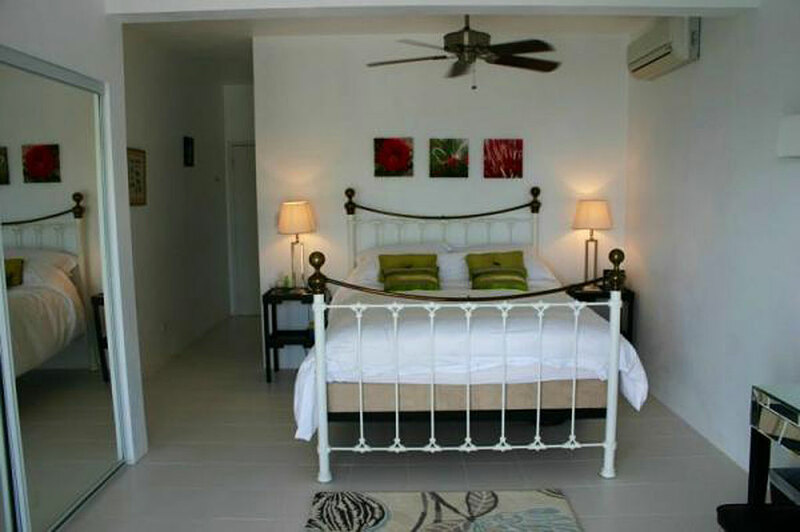 The master suite also has an exquisite dressing room with a drinks fridge. 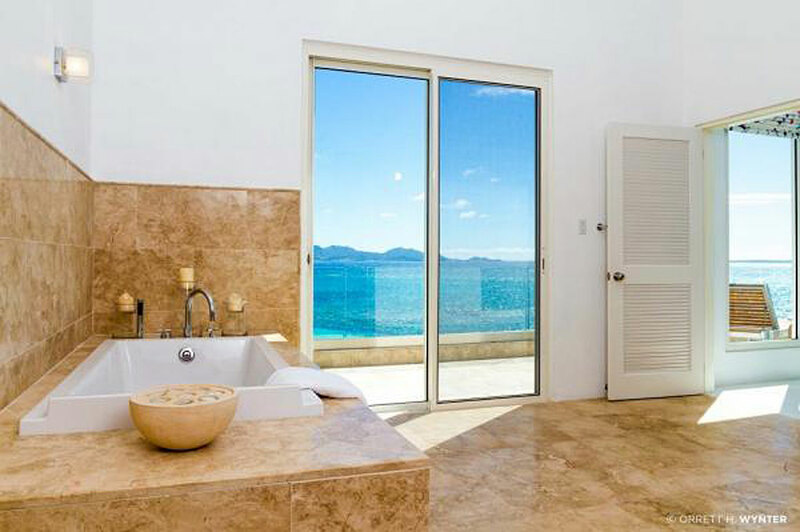 The large ensuite, airy bathroom has a bath and shower by Phillipe Starck. A recent addition is an Air-conditioned TV/Games Room with a vintage pool table, an exercise bike, free weights, Pilates equipment, weight and yoga mats. 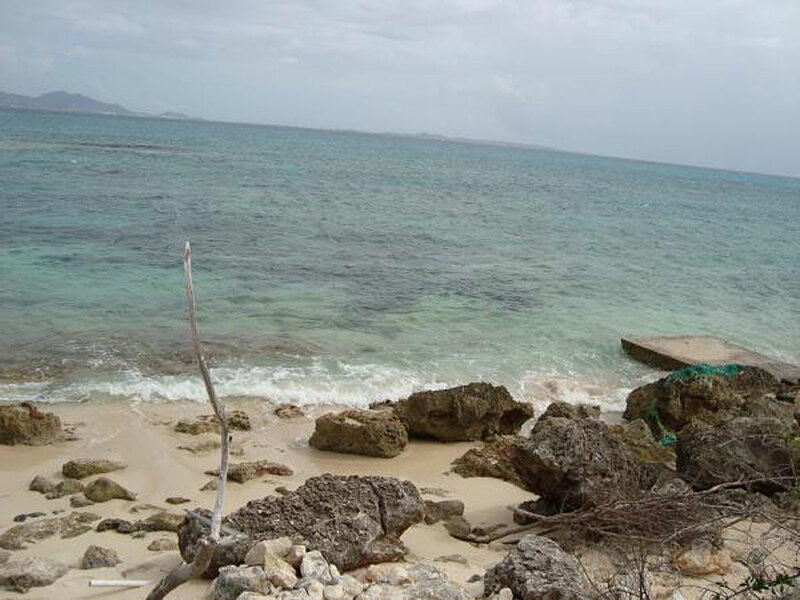 Other features include hammock, snorkeling equipment, life jackets, wireless internet connection, Bose iPod speakers, board games and books. Miscellaneous: Electric gate and fully enclosed property. 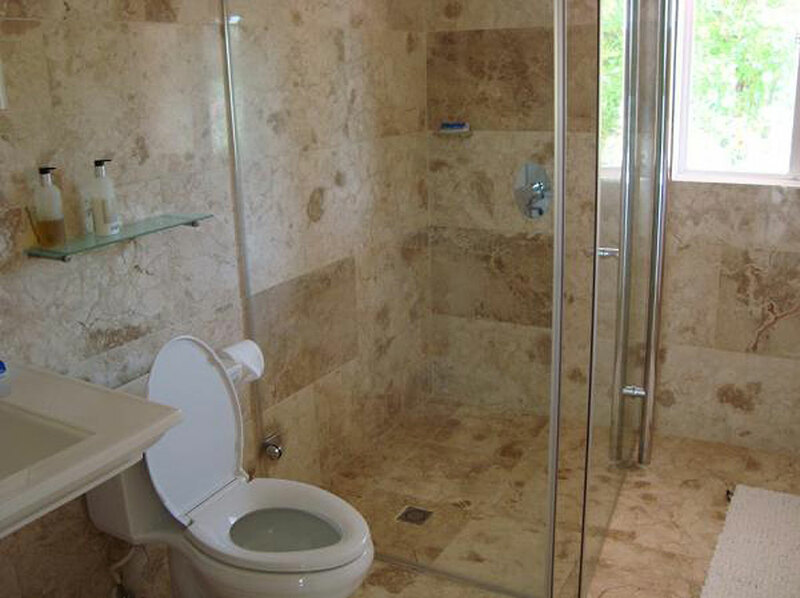 The property is accessed via a remote controlled gate and there is a security system which is monitored 24 hours. 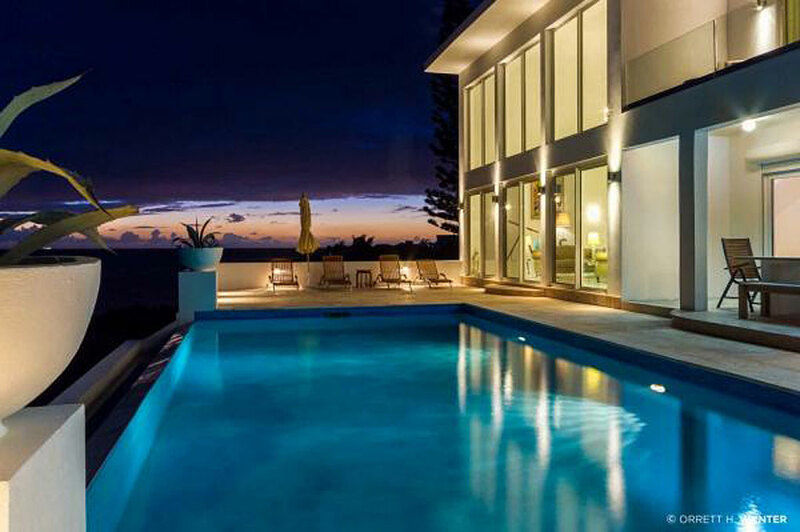 50% deposit is required at time of reservation with balance due 60 days prior to arrival. 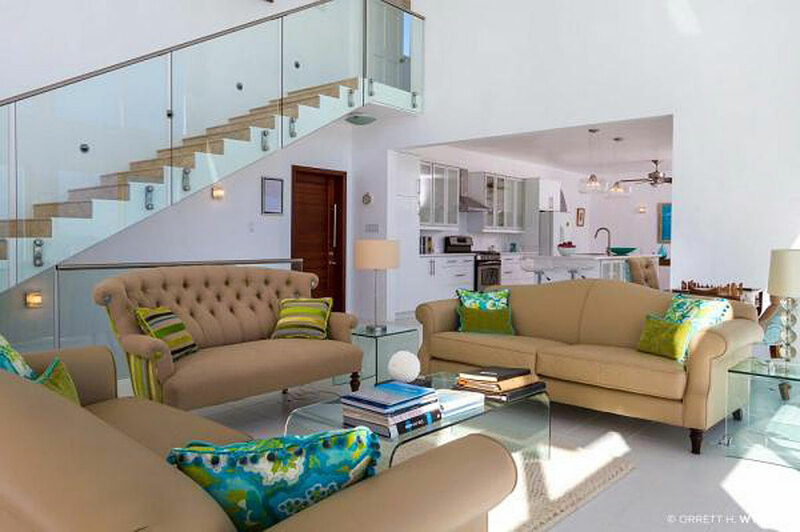 If the reservation is made within 60 days of arrival full payment is required. If canceled prior to 60 days of arrival a full refund will be issued (minus $100 administration fee). If canceled within 60 days of arrival no refund is provided. Quotes from visitors book: "Vista exceeds all expectations. 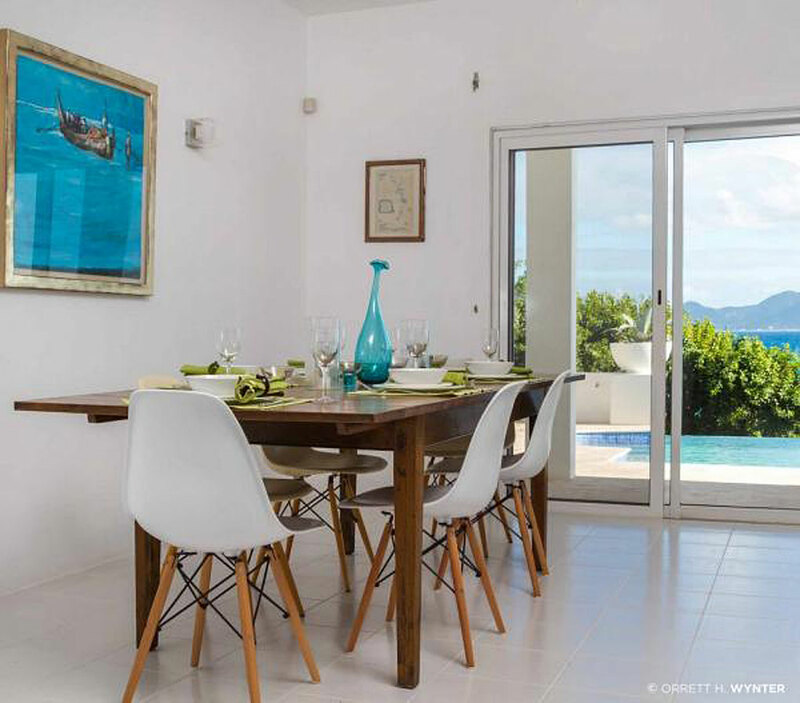 The wow factor is present in all directions whether it's looking over the beautiful infinity pool to the stunning view of St Martin or relaxing in the tastefully decorated sitting room." "If this is heaven I hope I am dead! This is paradise found. Vista is the most beautiful place I've ever stayed. Luxury all the way. 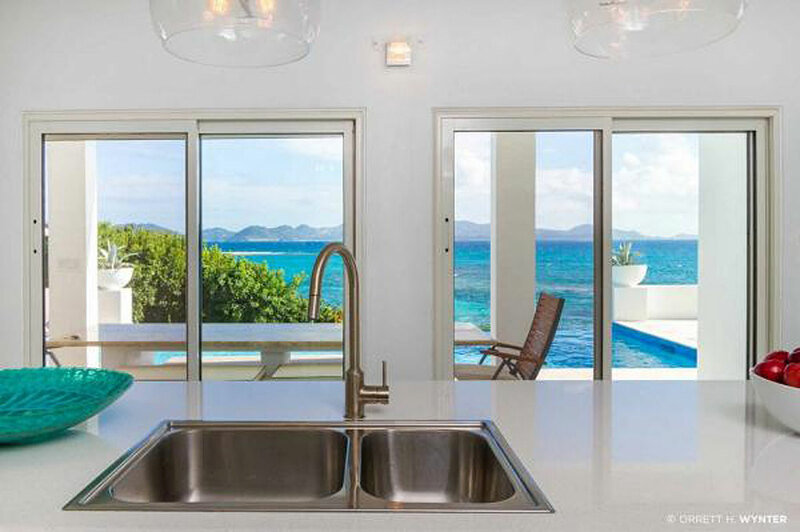 The views are breathtaking"
"This was our third trip to Anguilla and our first to Vista. 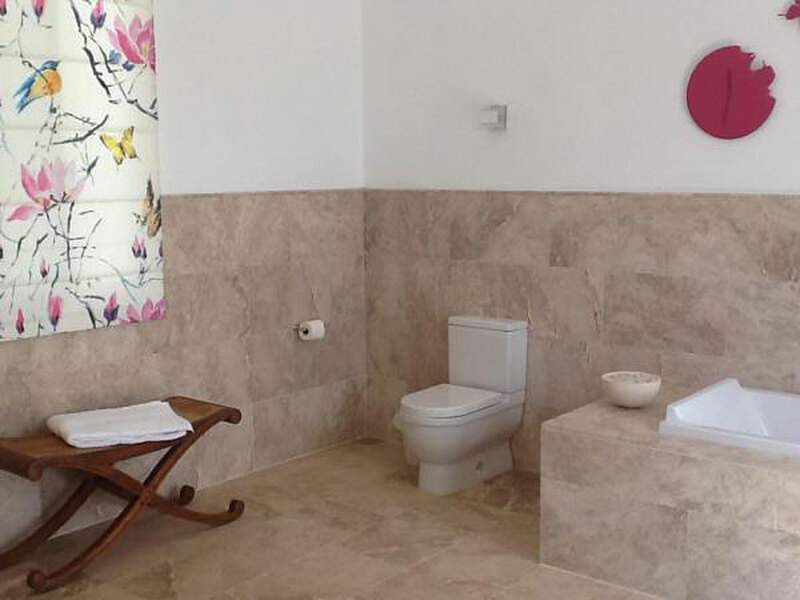 The villa is stunning,both sophisticated and oh so comfortable at the same time! 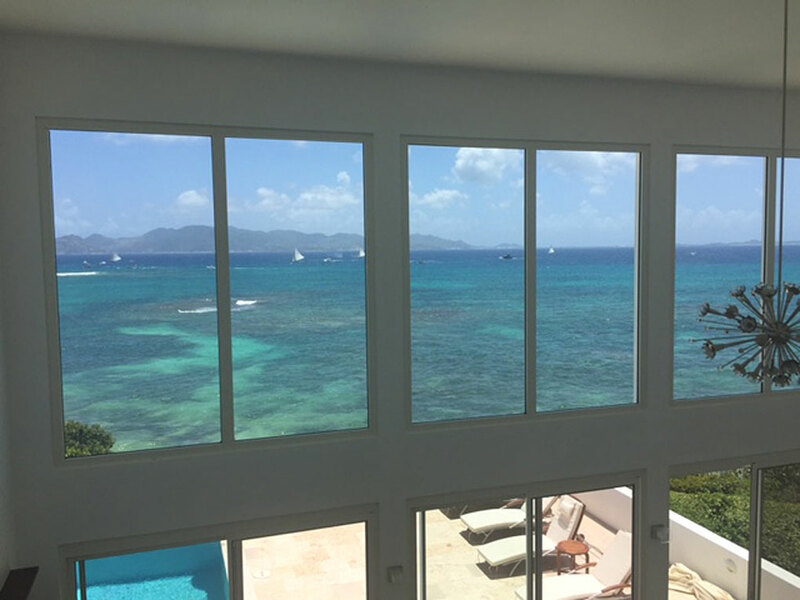 And I don't think there is a better view on the island." 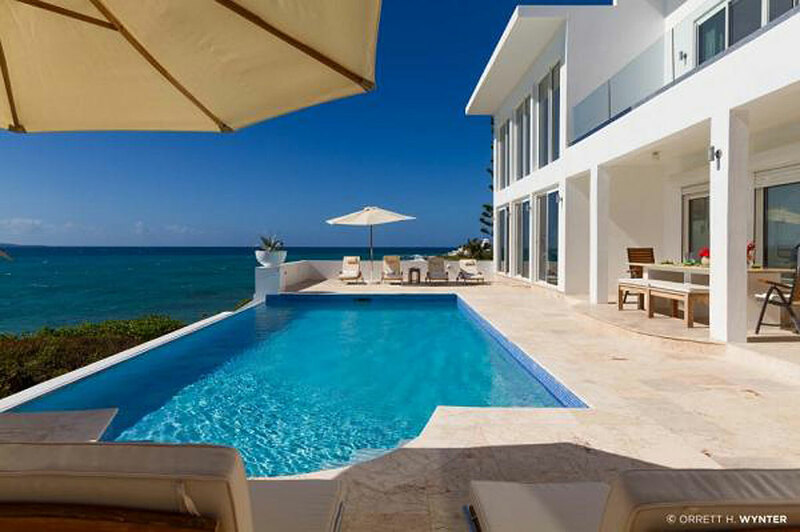 "I'm sitting watching the beautiful water and wondering why I'm leaving. 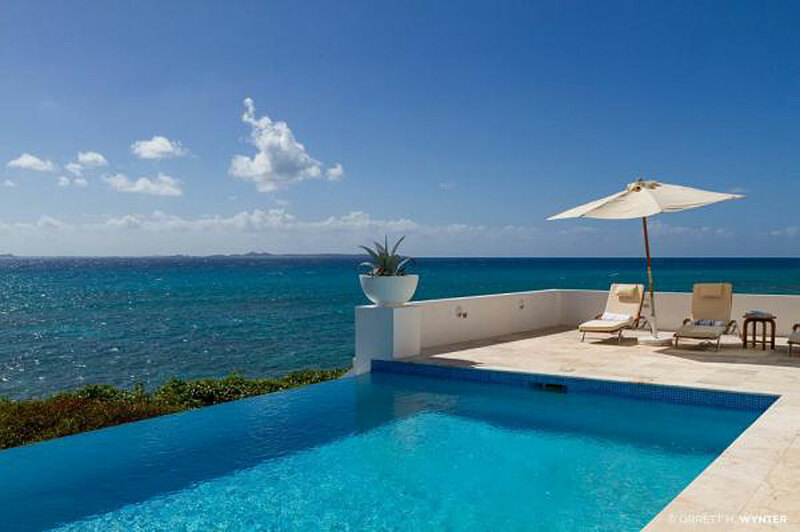 This is our fourth visit to Anguilla and Vista is our favourite property so far. We are trying to figure out when we can return." 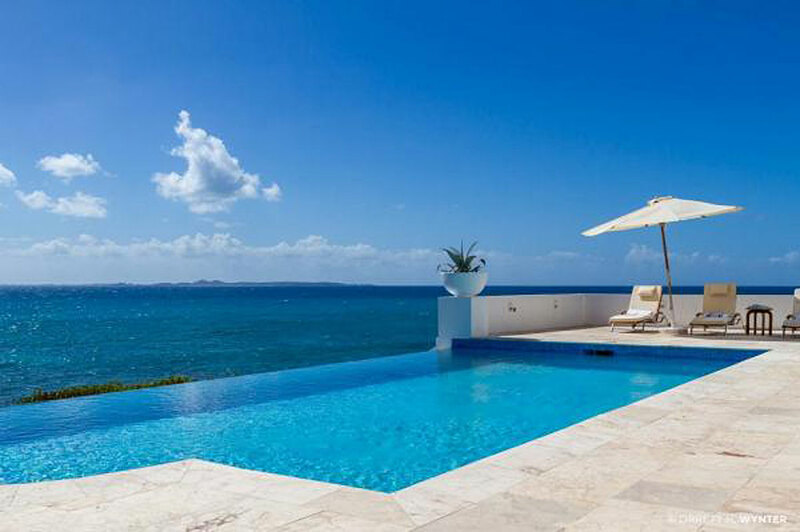 "We've been coming to Anguilla each year for the past 12 years. 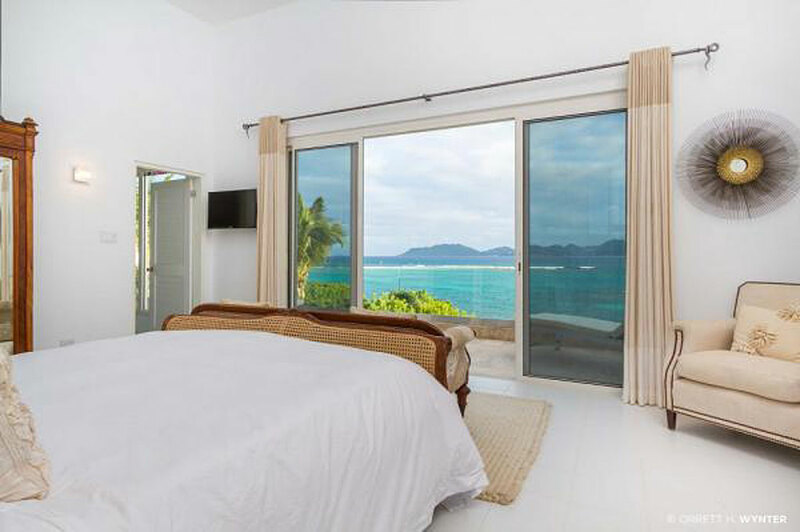 This is our favourite villa to date- fantastic view,comfortable beds,exquisite master suite." 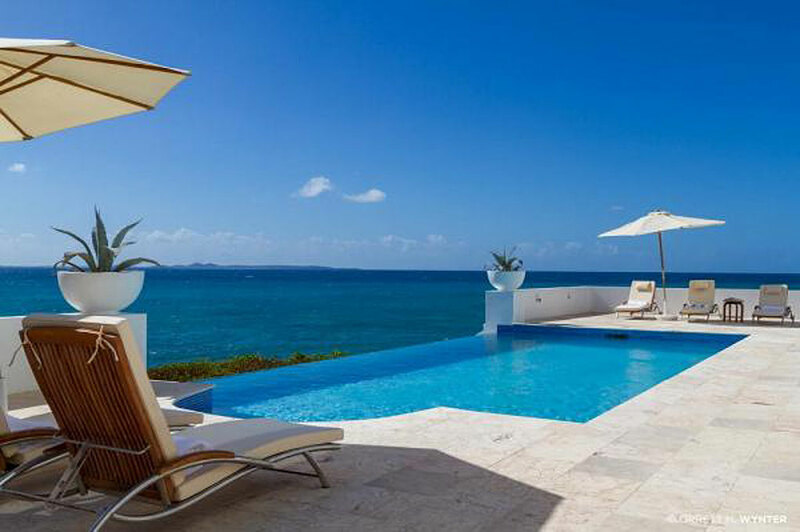 "This is our 6th trip to Anguilla and we loved every minute of staying at Vista. 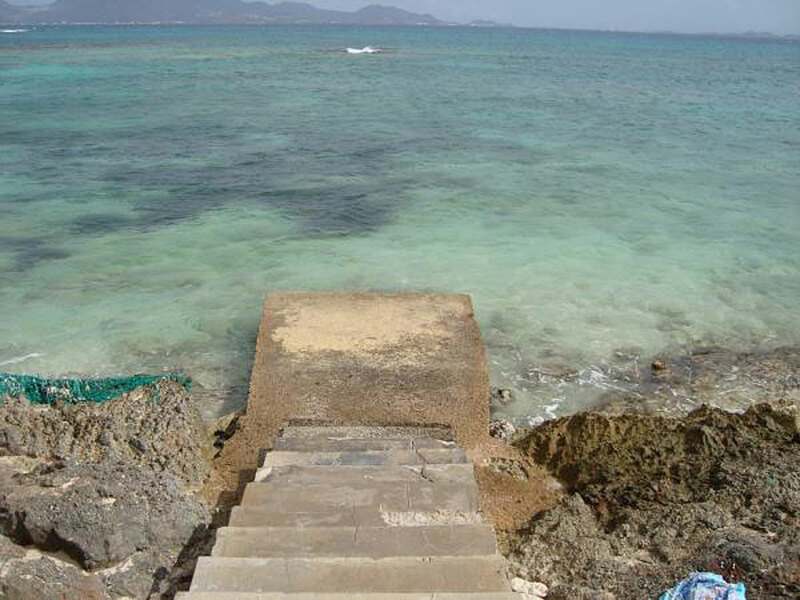 We spent a lot less time wandering the island because we could not bring ourselves to leave Vista." "It's hard for me to add more to what has already been written about beautiful Vista. 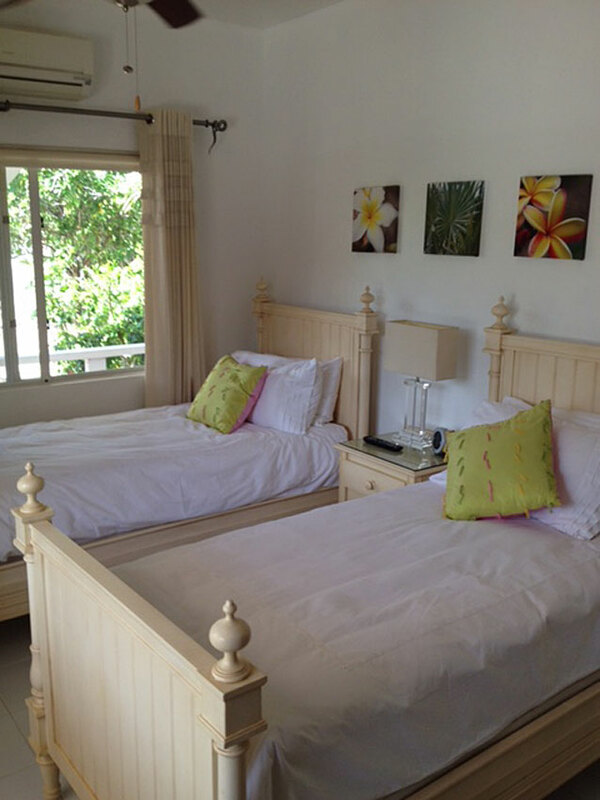 We have felt so comfortable and relaxed that it was hard to leave even to go to the beaches. The view is priceless! This is our 20th visit and so happy to have found Vista."